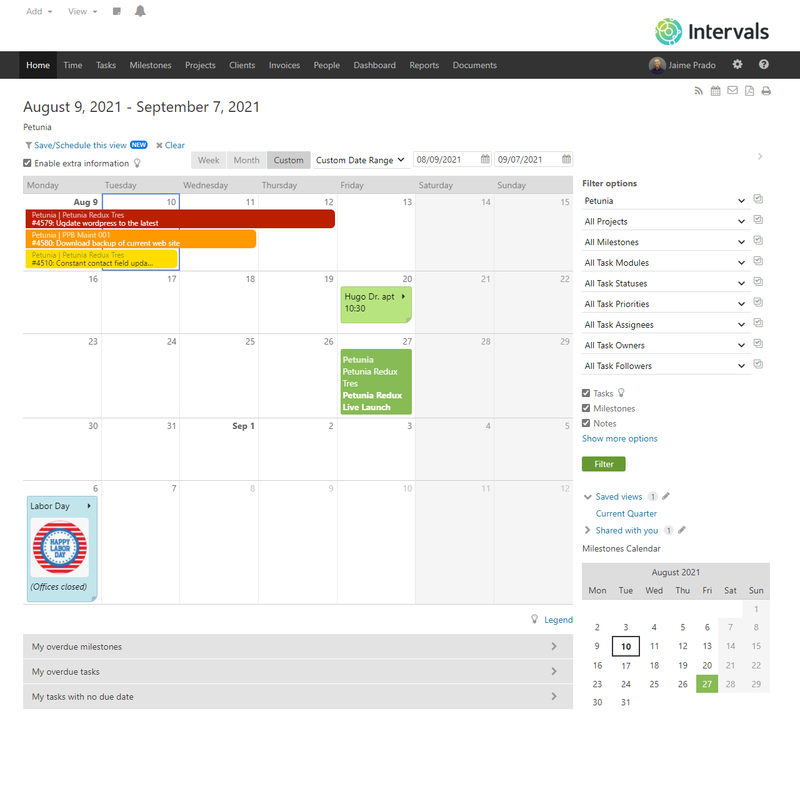 Toggle between a weekly, monthly or custom calendar view. Create custom filters for clients, project, or people. Right click to add notes, tasks, milestones or time for that day. 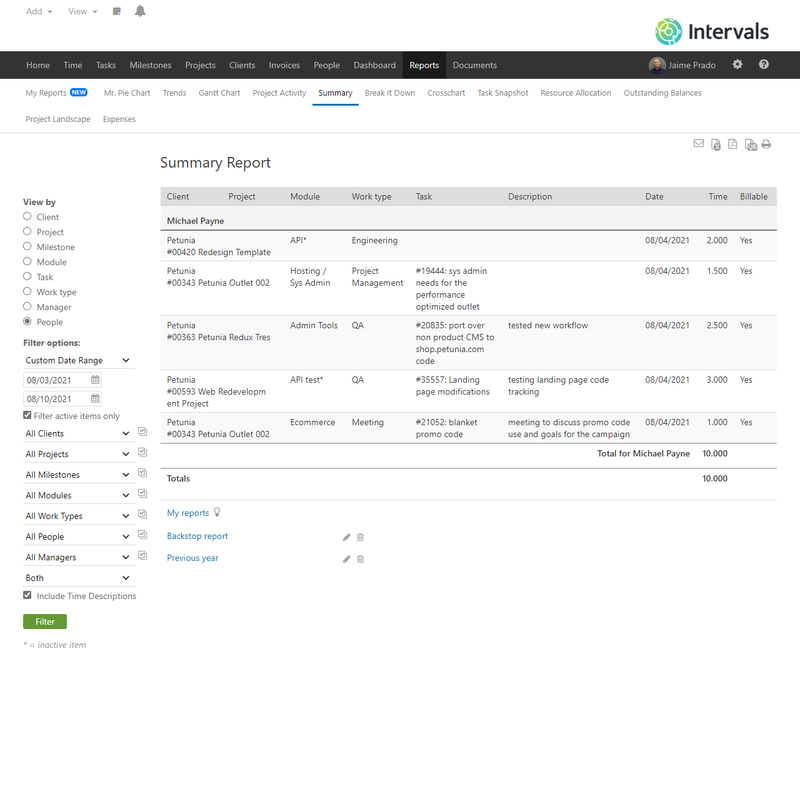 Get a glimpse of upcoming deliverables with the milestones calendar. 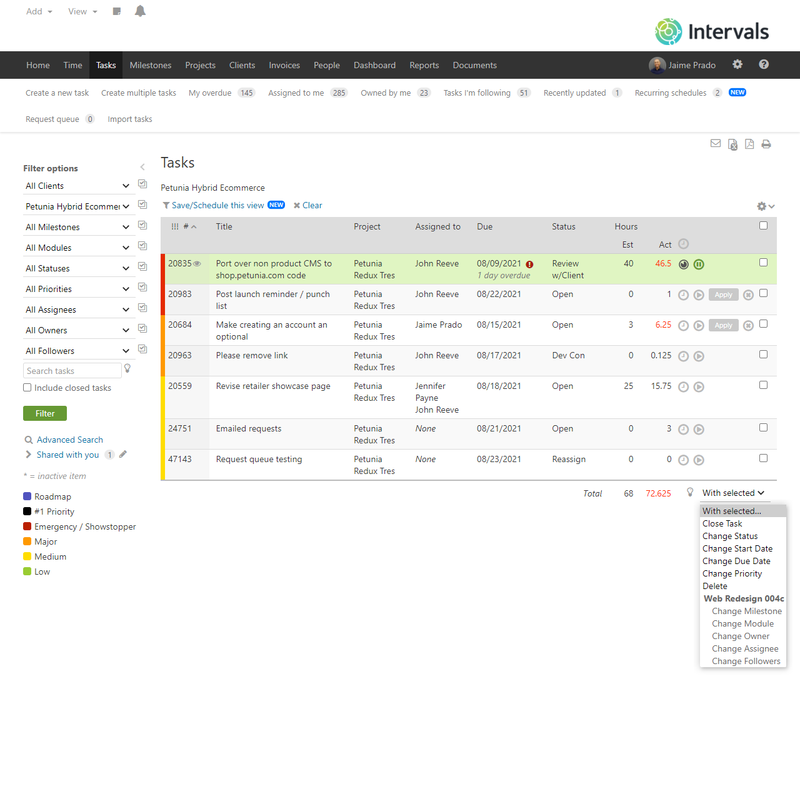 View tasks on the calendar by priority and duration. Drag and drop tasks and milestones to reschedule them. Dynamic graphing to make viewing data more pleasant. Summary of time entered for the current week. 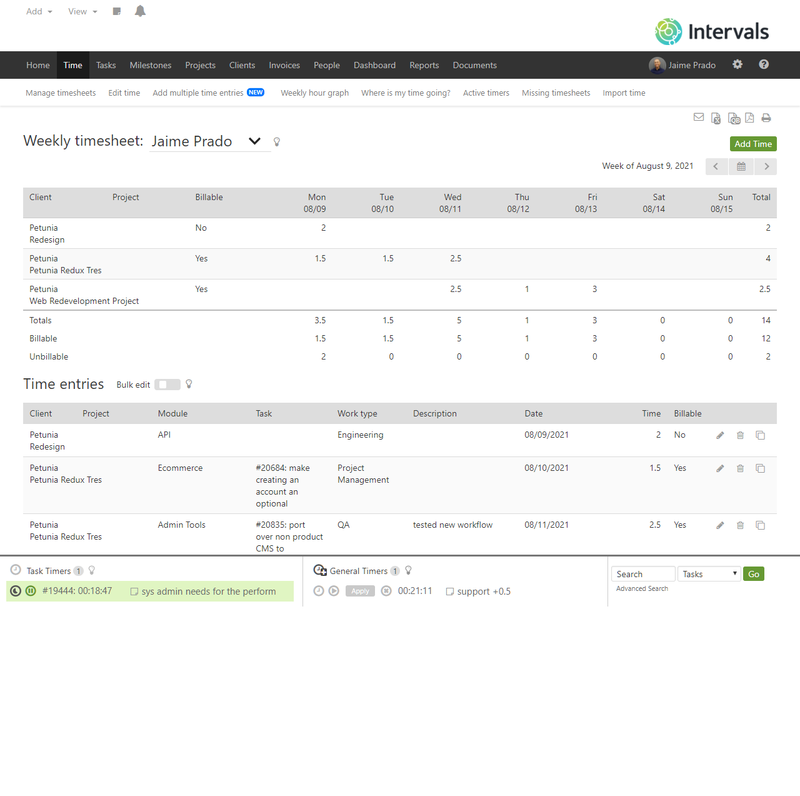 Export time data in one of many convenient formats. Individual time entries available for inline editing. Footer dock that includes quick and easy access to timers. Start a timer with one click whenever you are working on anything. Quickly search for tasks, projects, clients, documents, and milestone directly from the footer. Tasks conveniently organized by your preference (priority, due date, status, etc.). Right click on any task to perform common actions. Save your task filter for later. Update multiple tasks at once. Lists people who are running a timer against this task. For each task there are plenty of attributes that will help you manage your project workflow. Filter tasks easily for you or your team. 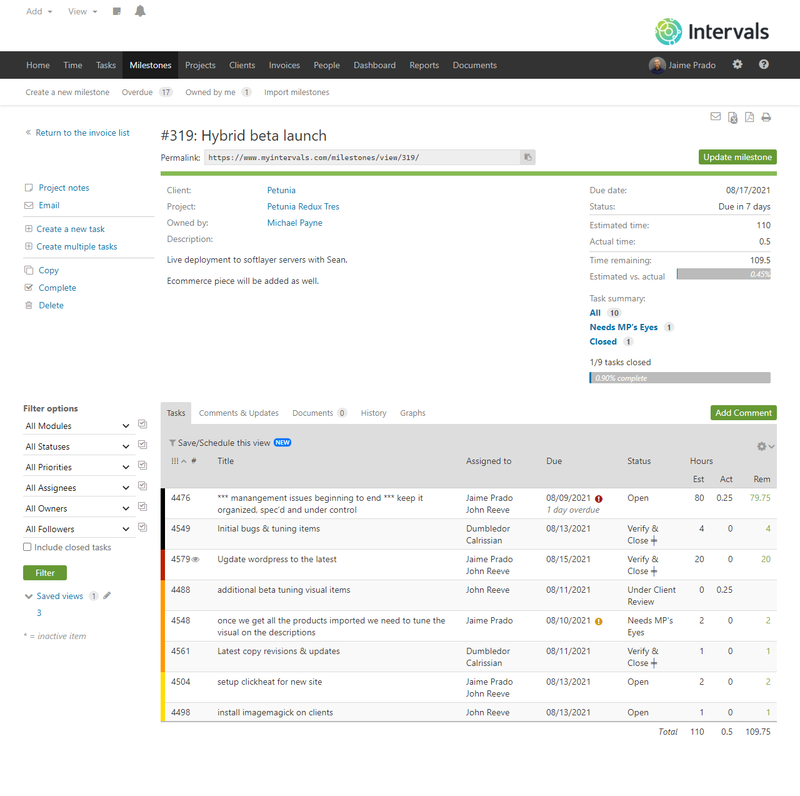 Keep a history of updates and comments, track time entered, and upload documents. Overview of total hours for the project. Financial overview of project budget. 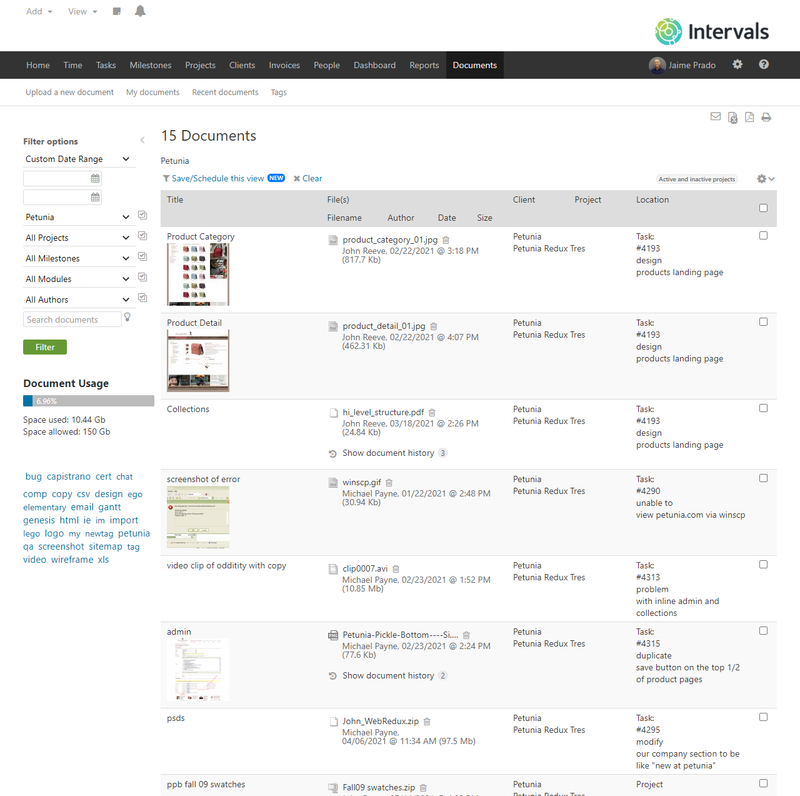 Search the document repository by date, client, project, author and keyword. Upload and maintain document versions. Documents are tagged for quick retrieval. 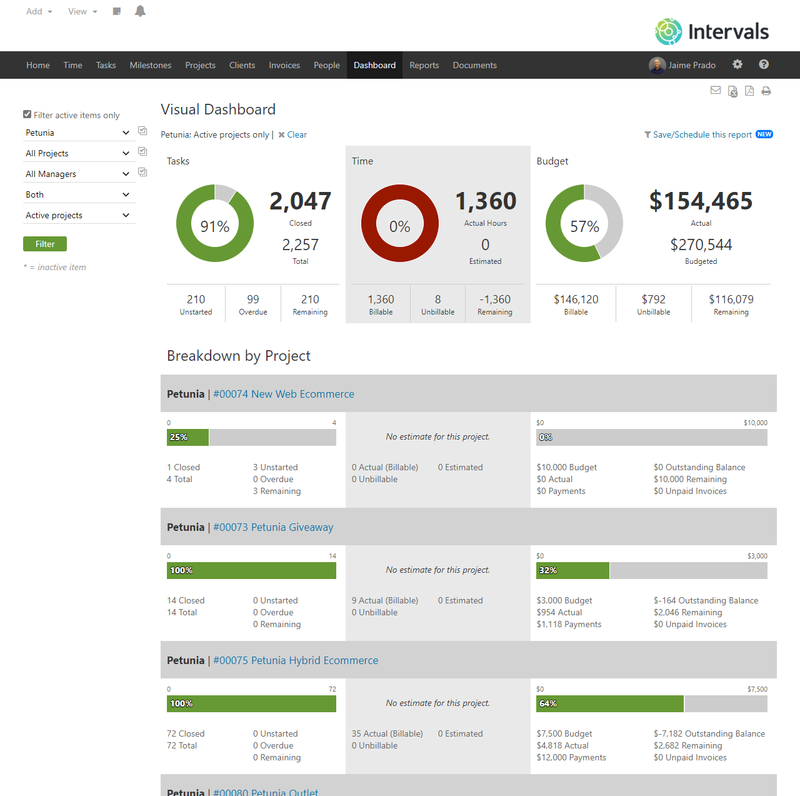 Visualize your tasks, time, and budget across projects. See the health of your projects easily. 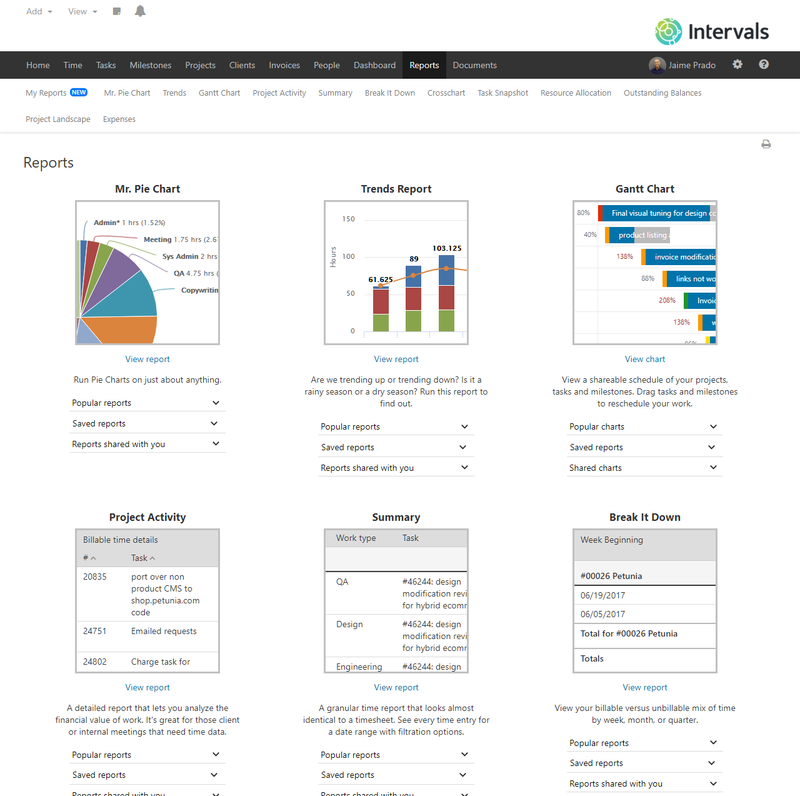 View the status of tasks, time, and budget used per project. Quickly see if projects are healthy or not. 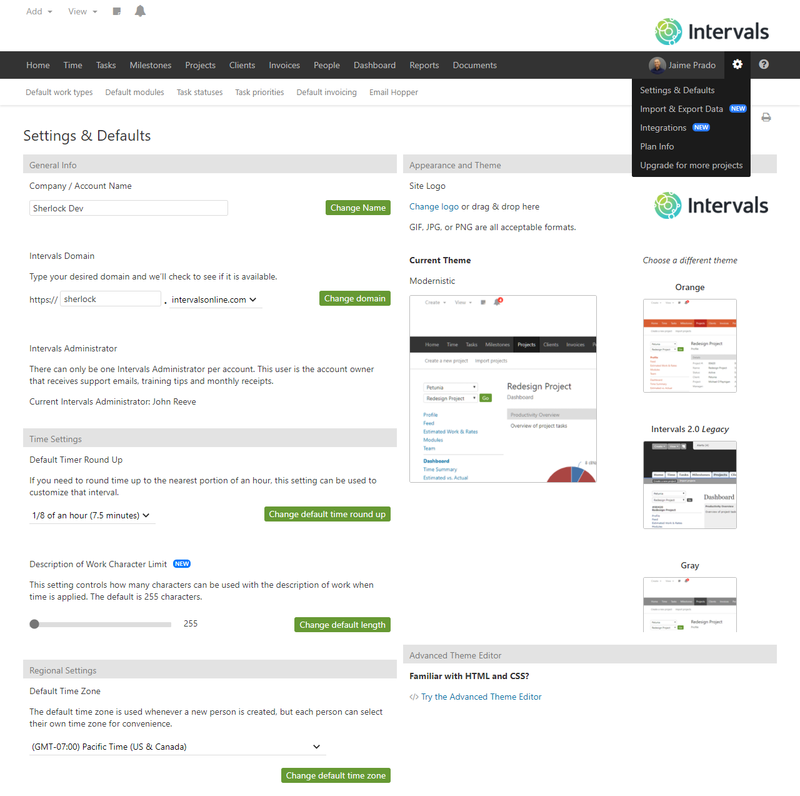 Create a custom dashboard view and save it for later. 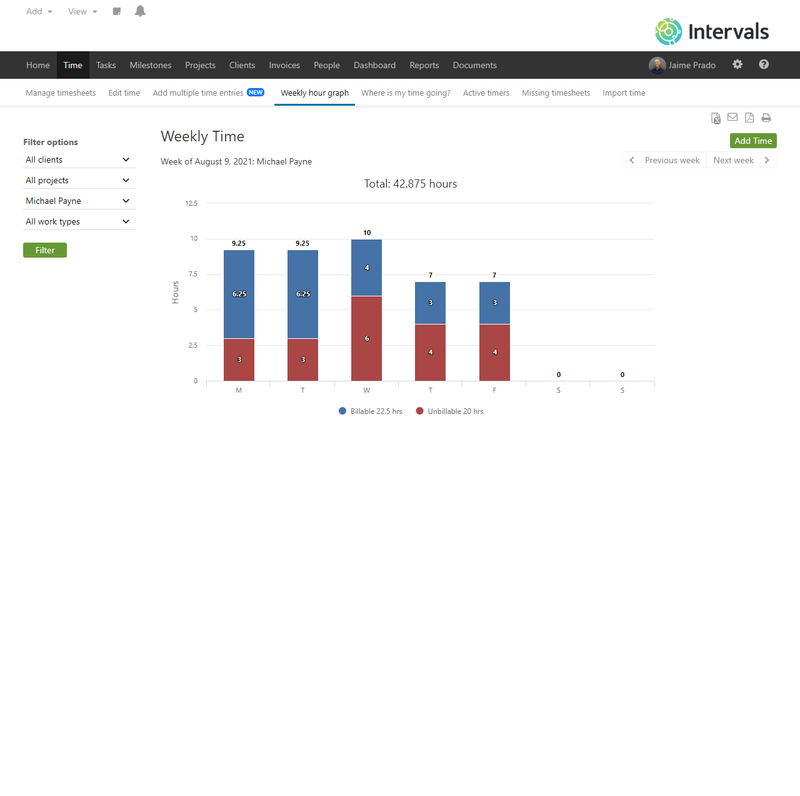 View your data in a number of different ways from high level charts to very granular time analysis on individual time entries. Easily export your data to manipulate it in a spreadsheet. Have a favorite report? Save it and run it in the future with one click. Detailed time entries shown for the current view. Easily export data for manipulation if needed. Run the Summary report to view detailed time entries for a client, project, milestone, or any of the other available parameters. Use the Options tab to change system settings or your plan tier. Pick a theme to match your brand or upload your own custom CSS for further visual customization. Modify defaults to match your process. Personalize where your team logs in. Change who owns the account. Round up time entries to the nearest portion of an hour. Choose a time zone and locale that matches your currency, date, and time format. 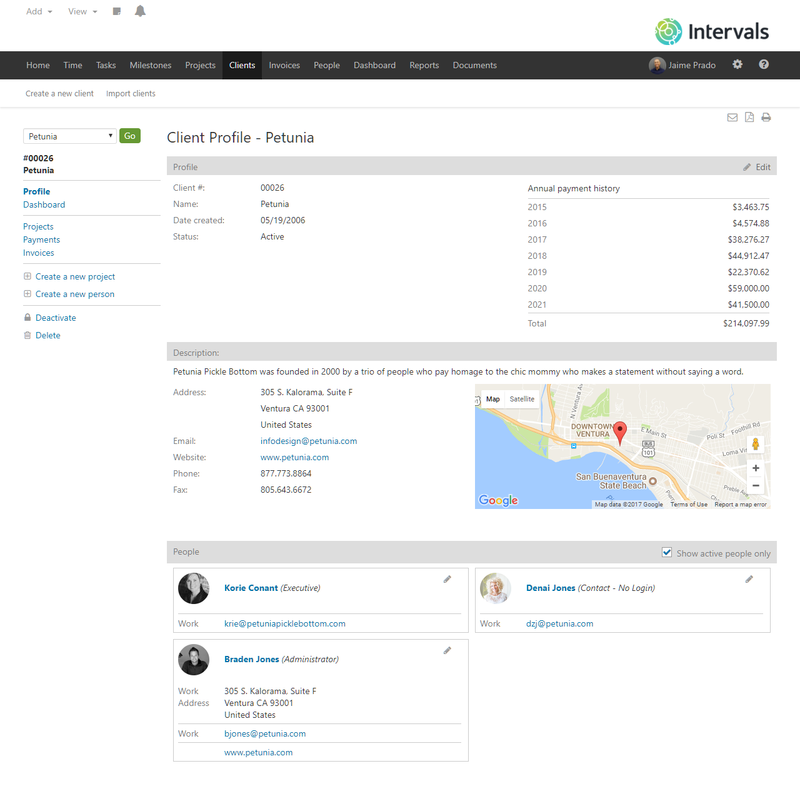 Easily view all projects, hours, payments and invoices for a client. Add multiple contacts to each client and chose whether or not they can login and participate in your workflow. 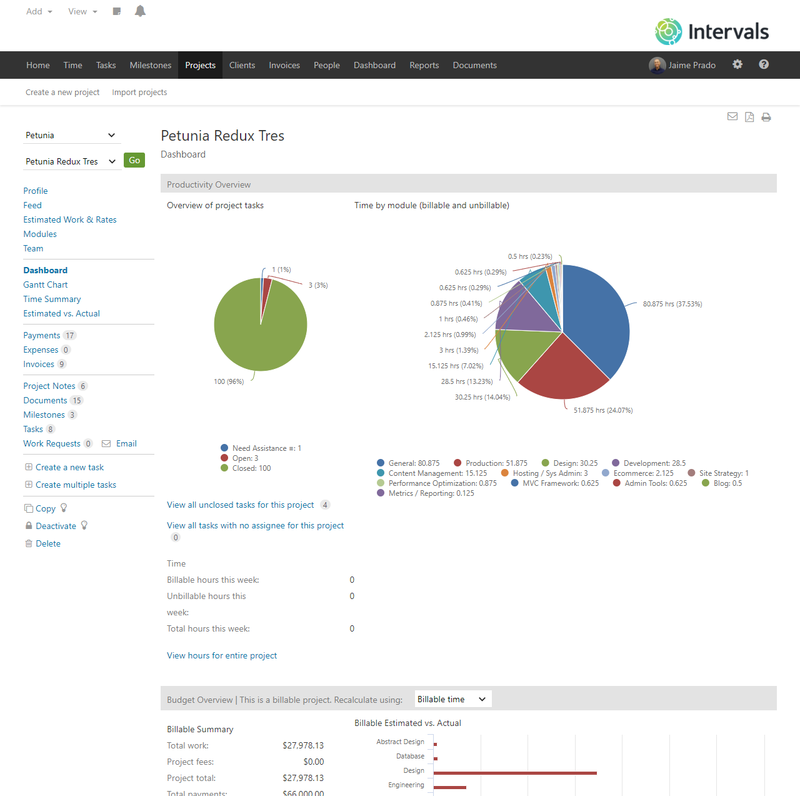 One click view of overdue and outstanding invoices. 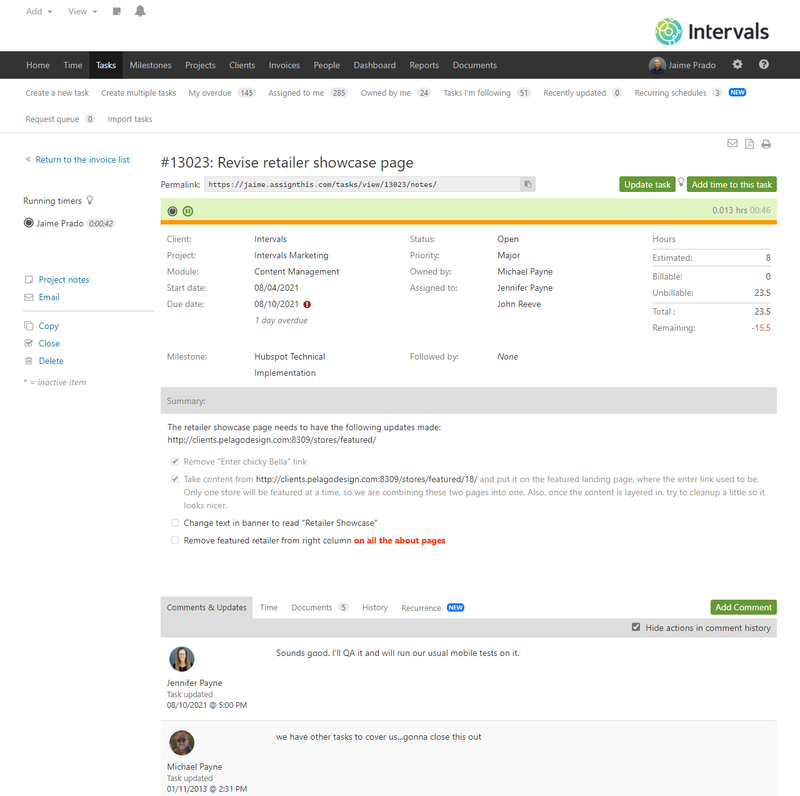 Create invoices based on actual work performed OR freestyle. 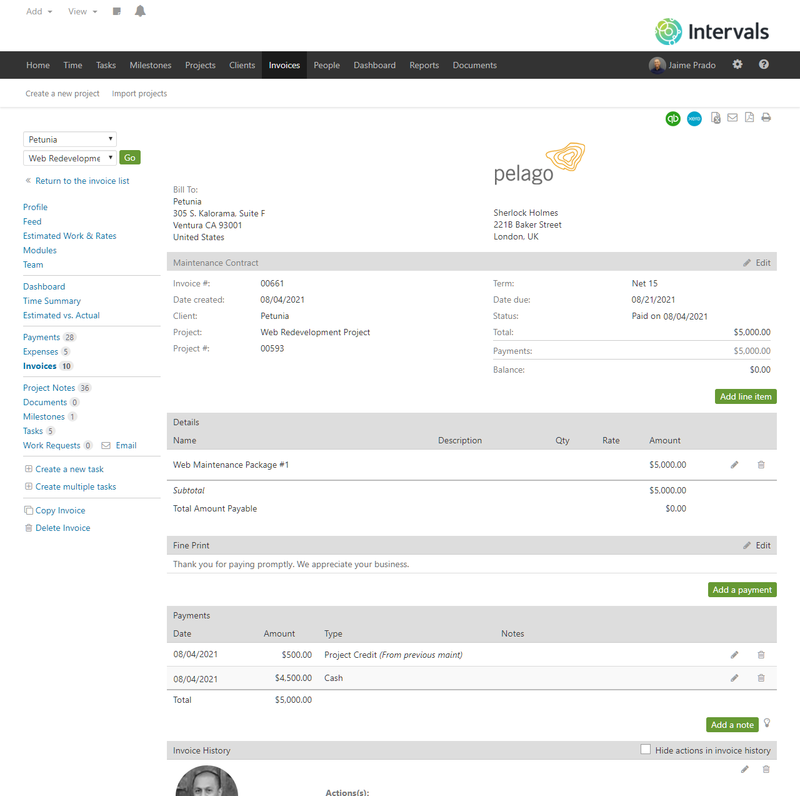 Retrieve invoices by Client, Project, Invoice Status or Date of Creation. Notifications for timesheet reminders and new tasks in the request queue awaiting assignment. 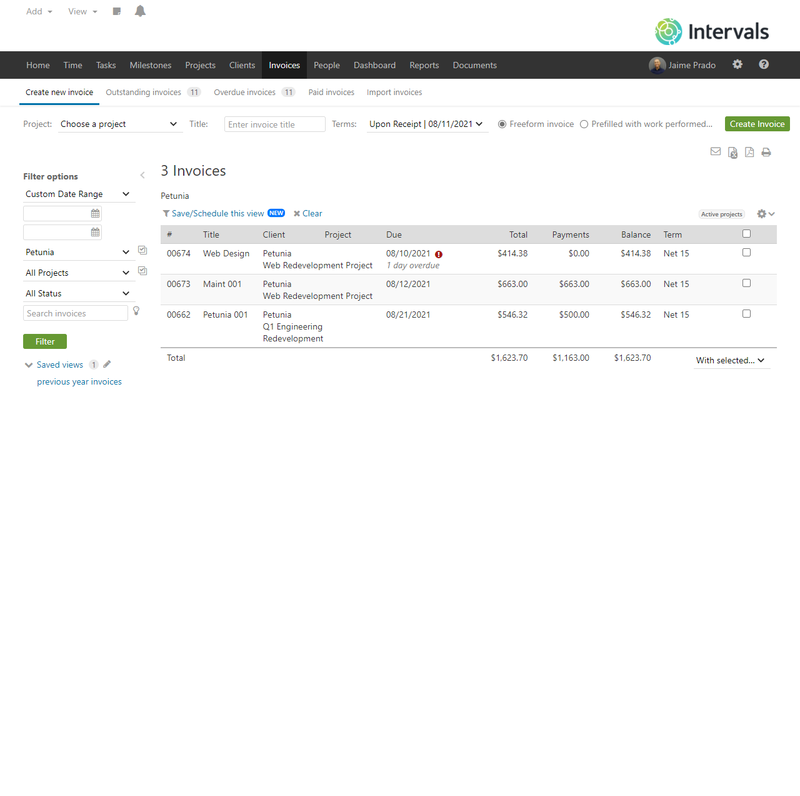 Specify invoice details such as date, project, client, invoice number and term. Canadian GST, Quebec PST, and other second taxes are supported. Invoice details can be auto-generated from time and work done on tasks, or can be manually entered as a free-form styled invoice. Enter and keep track of payments. Quickly view and create projects, milestones, tasks and more. Export an invoice to QuickBooks, Xero, FreshBooks, PDF, Excel, or simply print or email it to your client. Use milestones to manage multi task deliverables. Reschedule the milestone to move all of the associated tasks. Manage a subset of tasks for each milestone. Filter milestone tasks easily by any attribute. Keep a history of updates and comments.